Idaho's appeal is firmly rooted in active outdoor pursuits, unspoiled wilderness and a no-nonsense pioneer heritage. Idaho conjures images of lonely mountain cabins rather than strip-malls and fast food joints. In many ways a visit to the state feels like a refreshing exit from modern America. Idaho's greatest draw is its ski slopes. This otherwise overlooked state regularly features on lists of the top ski destinations in the US. The famous Sun Valley ski resort is a long-term favourite and is generally considered Idaho's most popular tourist attraction. Boise, the capital, also has its own backyard snow playground in the form of the Bogus Basin Mountain Recreation Area. Boise boasts some interesting cultural sightseeing, beyond the city, the vast majority of Idaho's top attractions are scenic. 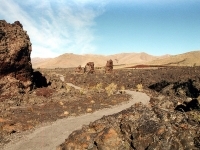 The lunar landscapes of the Craters of the Moon National Monument are a unique sight. The Sawtooth National Forest, in the centre of the state, promises pristine forest and mountain landscapes, as well as more than 300 lakes. Hell's Canyon, the deepest gorge in North America, attracts adventurers down its gorge.